On Highway 43, near the Alberta–British Columbia boundary, I turn my car down a dirt path and come upon a clearing. One left turn and I have arrived in Demmitt, a tiny hamlet an hour west of Grande Prairie and six hours northwest of Edmonton. Before me, in the middle of a seeming no man’s land, stands a chalet-like building made from thick-cut timber panels. For four years I have made trips up here to the Peace Region, and for four years I have heard about the makings of the Demmitt Cultural Centre. I bought a society membership early on, and ever since, wherever I was, from Hong Kong to Finland, I received semi-regular email updates about the building’s progress, including photos of the timber framing, news of the grand opening and upcoming programming. At last I am here to see the centre with my own eyes. In front of the double-door entrance, a ghost-white school bus sits among a handful of pickup trucks. The sun is starting to set and there are no streetlights. Through the bus’s rear window, I see hats of all shapes and sizes strewn over the piled-up instruments. This can only mean one thing: Fred Eaglesmith is playing tonight, and his vegetable-oil-fuelled tour bus has already arrived for sound check. I walk through and under the building’s handcrafted bridge entryway. The timber-framed foyer opens up into a wide corridor leading to the two-storey main hall, and a wall of windows from floor to ceiling overlooks a vast empty field, an open view of seclusion and possibilities. At the box office, Teresa von Tiesenhausen sounds slightly exhausted from volunteering the night before, when the hall served as the region’s voting station for the 2012 provincial elections. She does not immediately recognize me, but I remember her—a petite woman whose name announced all those emails filled with updates. Teresa has been a resident of Demmitt for decades. Her husband, Peter von Tiesenhausen, considered one of Canada’s senior land artists, was the sole reason I had visited Demmitt in the first place, in the spring of 2008. I feel I have stumbled into an extended family gathering. Everyone seems to know each other, home-baked goods accompany the self-serve coffee, and people look me straight in the eye when I approach them. Men and women of all ages, from both sides of the provincial boundary, fill the main hall and balcony. I spot Peter in the main room, standing near the hearth, chatting folks up. He has since stepped back to refocus on his life and studio practice, but the construction of this building possessed him for the better part of two years. As the driving force behind this project, von Tiesenhausen is the reason I am back in Demmitt again. Embodying a less transient way of life, the centre combines old-world craftmanship with modern technologies for sustainable living. I HAD lived in Alberta for 20 years before finally venturing north of Edmonton in 2008. On the road toward Alaska, the breadth of the Rocky Mountains spread beyond my imagination. Over four hours I saw the Alberta of urban sprawl, farmland and deep valleys. During that first visit to Demmitt, Peter guided me among structures in various stages of growth and entropy on the von Tiesenhausen land. Ships woven from willow branches sat in empty fields, and men charred from fallen pine stood as sentinels. Along with sculptures, small buildings populated the land. Further back, a small guest-lodge had been handcrafted from pine-beetle-killed timber, and insulated with paper from a former exhibition of drawings of pine trees on paper also recycled from mulched timber devastated by beetles. A straw-bale doghouse sat near the log pile, and a couple of huts using straw-bale insulation were under construction. Completely biodegradable, straw-bale insulation remains one of the most effective heat regulators in the history of housing construction. What struck me then was the attention to detail and craftsmanship of each building. Alberta’s housing boom had created a standard of prefab housing and staple-gun framing. For my IKEA generation, medium-density fibreboard and uniformity are the norm. I recall von Tiesenhausen defining sustainable living as being comfortable where you are while not impinging on future generations. He believed this was possible, or at least worth pursuing. Four years after this initial meeting, I watch from the balcony of the 6,200 sq. ft. handcrafted cultural centre, packed on a Tuesday evening, and see with my own eyes an example of sustainable living in rural Alberta. The centre operates on an annual overhead of only $10,000, thanks to low-waste initiatives such as the straw-bale insulation, rows of composting toilets, triple-glazed windows and an 11-inch-thick insulated structural panel in the roof. The $1.3-million building was designed by Michael O’Rourke, who also happens to teach biology at the nearby Beaverlodge Regional High School. The largest donation came from natural gas giant Encana, which gave $100,000 without even requiring a naming right. Embodying a less transient way of life, the centre is an ecological marvel that combines old-world craftsmanship with modern technologies for sustainable living. 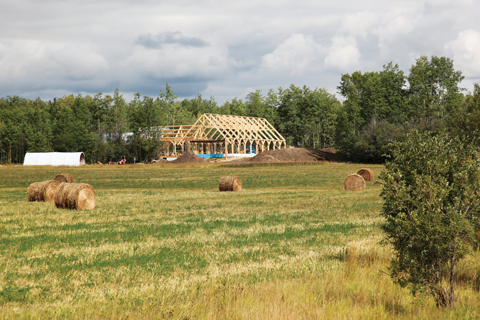 The Timber Framers Guild of Canada was hired to lead the process, and they trained a crew of volunteers eager to learn the craft. 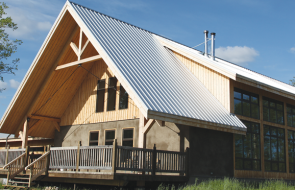 Built almost entirely by volunteers, with locally harvested timber reclaimed from trees killed by pine beetles, the structure shot out of the ground in just nine months. Von Tiesenhausen showed an unrelenting drive to finish the building—a drive he admits raised problems during the construction period. Refusing to take “no” for an answer from anyone as work got underway, von Tiesenhausen was praised and berated by friends and neighbours alike for his unbending determination. His artistic ego led the project, and finished the project. Warm as the hospitality may be up here, some locals remain opposed to the centre. In April 2011, the Grande Prairie Daily Herald-Tribune quoted residents at a council meeting who didn’t want to see the former community hall replaced, and who believed the proposed new centre’s size and cost excessive. Demmitt may be a hamlet of 30, but over 100 people signed a petition against the project. Some residents still refuse to set foot in the building. Still, the centre fills its 300-person capacity on most nights, like this evening with Eaglesmith and company. Nothing of this scale had been undertaken before in the region, and the high stakes of the project built relationships as much as it strained others. Demographics are shifting in rural communities, with younger people returning to start new lives, but change has always been viewed as both a blessing and a curse. 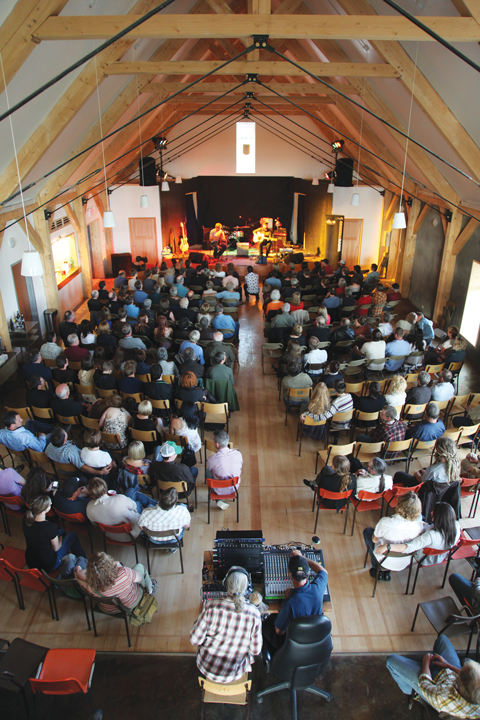 What goes on between neighbours remains between neighbours, but as a model for sustainable culture in rural Canada, the Demmitt Cultural Centre is growing into a beacon of hope, praised by architects and performers alike. For those who choose to set down roots in the district—rather than get rich and get out—such community venues are essential. The opening act, one of Eaglesmith’s guitarists, wails out a handful of songs inspired by bar waitresses and road-weary disillusionment. The crowd is receptive; driving is a common denominator here. I’d wager everyone has arrived tonight by some form of automobile and spends a significant portion of daily life on the road. It’s not uncommon for northern residents to travel close to 400 km south for a concert or a special celebration in the closest major city; venues such as Demmitt’s allow for a night out closer to home. 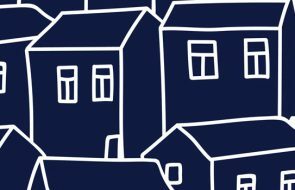 For those who choose to set down roots in the district—rather than get rich and get out—such buildings are essential. The Demmit Cultural Centre has become a touchstone, a meeting place for dances, weddings and other communal rituals. Young couples hold hands and older folks get rowdy with requests. Some have come directly from the fields, and crusts of dried mud fall from their boots as the night continues. The wholesome, family-gathering atmosphere persists despite Eaglesmith’s best efforts, and I feel myself, an outsider, noted and welcomed. Through its simple existence, the Demmitt Cultural Centre is redefining community beyond a sense of shared geography. 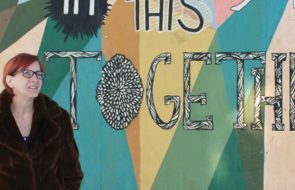 Demmitt is becoming a destination for Peace Region residents seeking culture, as well as attracting visitors from farther afield. In 1901 rural Albertans outnumbered their urban counterparts four to one; by 2001 that ratio had reversed, and amenities for the rural population consequently declined. In the past 50 years, in the Demmitt area alone, two community halls have come and gone. Those structures did not last more than a few decades, and this development-friendly approach—build and rebuild—has repercussions for people trying to put down roots. The current Demmitt Cultural Centre was built with a vision and a foundation to last twice as long as its predecessors. This building is for those who come to stay. At the Eaglesmith show, held on a weeknight, the house is packed. Unlike at other concerts up north or even in the city, I never sense that seething possibility of a barroom brawl. Four years from his first conception of the project, Peter admits it’s not a perfect model, that he and his family still have to drive in and out of town and people have to drive to the hall. But they don’t have to drive over 100 km anymore for a night of live music. We make the changes that we can, and we live in the best way that we can. Eaglesmith and company play a full two-hour set and don’t budge on the song requests; they have a new album, and they’re going to play through it. It’s the band’s first performance at the centre, and likely not their last. At the end of the night, those of us who stay help put away the chairs, collect all the bottles, sweep up the mud crusts strewn along the rubber sprung recycled gymnasium floor and shut all the windows. Teresa makes sure all the volunteers are fed and packs up the leftovers for the band. We shut down the building and sit freezing in the pitch black, using our collective headlights to make sure everyone gets to their cars all right. Then we each turn back onto Highway 43. Former Edmontonian Amy Fung writes and curates in Vancouver. Currently she is curating They Made a Day Be a Day Here.